My Nameless Child: Being Held Through Miscarriage | Simple. Spectacular! I’m supposed to be pregnant. I’m supposed to be mid-third trimester, eight months along. If it were up to me. If I was the one who got to decide. I’m supposed to be gushing over 3D ultrasounds and journaling about how many times the baby kicked today after I drank orange juice and snuck an extra cupcake. I’m supposed to be complaining about feeling huge and about my middle being stretched to the max and about heartburn and about having to wake up every few hours to use the bathroom. I don’t get to decide. One of my prayers in 2013 was taken from the Lord’s prayer, to truly ask that God’s will would be done here on Earth – or more specifically, in my world, my life – as it is in heaven. I’m an organizer who loves to control, and God had been working on me, for well… at least two decades, about acknowledging Who is truly in charge. I discovered I was pregnant with my first daughter Gianella on my Pop Pop’s birthday in 2010. I couldn’t wait to tell my husband. Shortly after, I wanted to tell my parents and then announce it to the whole world! But, then, there’s the three-month rule. It seems to be the common standard that everyone waits until they are three months pregnant to make a public announcement about a pregnancy. You know, before they make it Facebook official. I really didn’t want to follow the three-month rule, like so many other people do. It didn’t make sense to me. I was pregnant. It was exciting. And it was a fact. And I wanted other people (ahem… anyone and everyone) to know! But, alas, my husband and I think differently. He’s the mozzarella; I’m the tomato (if that doesn’t make sense, read this). He is more private, and he wanted at least a few days for us to celebrate together, like a fantastic secret we could enjoy on our own. Then, he wanted to share the secret with just our parents and siblings. He was ok with letting the outside world wait their expected three months. Although I didn’t feel that way, I could see where he was coming from, and we waited. Everyone did indeed celebrate with us, and our daughter was born in August of 2011. Fast-forward nearly two years. I found out I was pregnant again! I had the same can’t-hold-it-in feeling and couldn’t wait to tell my husband. It was July 17, the day after our eight-year wedding anniversary. This time, we told our parents right away. 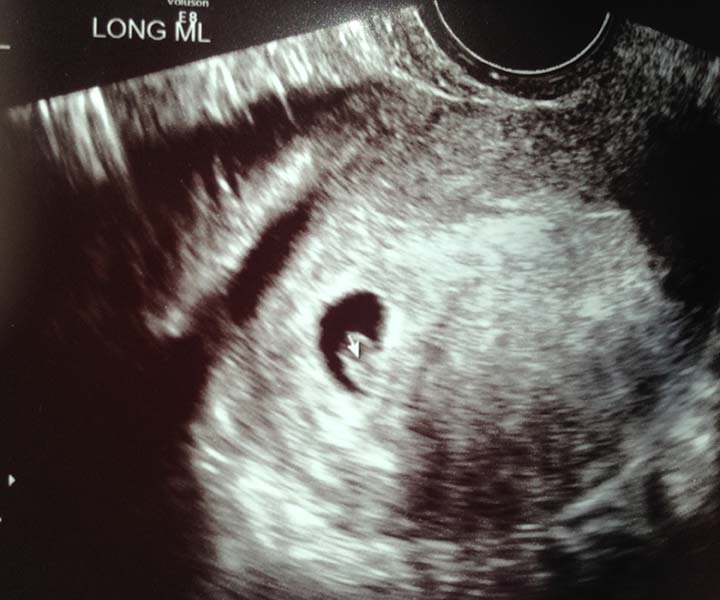 Before the prescribed three months was over, I brought our first ultrasound photo to that same Pop Pop; this time I told him the news as he lay in bed in a nursing home. I shared the news with the family members who were visiting him that day. I shared some more to my favorites at girls’ night out. The celebration started early this time! But we still kept the news from most of my family, friends, the general public… and Facebook, just like the first time. I’m a planner. With my first pregnancy, I read the books and planned as well as I could, but there was still so much uncertainty. The second time around, since I had gone through this pregnancy thing already, now I was confident, and I started preparing with vigor and direction. I packed all the winter pants and sweaters I knew I wouldn’t be able to squeeze my pregnant belly into. I unpacked some maternity favorites from a few years before. I picked out my favorite formal maternity dress I didn’t get to wear the first time around, and I made a mental note that this time I would get to wear it to my cousin’s November wedding. I signed up on pregnancy-related websites to receive weekly emails about what my baby would be up to that week… when his or her eyelids and fingernails were formed… when he or she could hear me or get the hiccups… what kind of fruit was comparable to the size of my little Mister or Miss that week. I also scheduled a 3-D ultrasound, so we could get a glimpse of our new little one as early as possible – this was one of my favorite things to see when our daughter was pre-partum. I waited anxiously as I approached week six. It was around this time with my daughter’s pregnancy that I began to get extremely nauseous. You know, morning sickness… or, as I like to call it every-waking-minute-of-my-day sickness. My husband was resigned to cook all of his meals outside on the grill, since the smell of food sent my stomach reeling (not that he complained about grilled meat every day!). But this time, week six came, and the sickness didn’t start. Those favorite girl friends said that every pregnancy is different, so I figured that was the case. A few other things just felt different too; I look back now, and I’m not exactly sure what those things were, but it was just… different. My conclusion? This new Baby was a boy! We had an ultrasound to get a more accurate due date for the arrival of Baby. I had done this once before with our daughter, too, and I was secretly just really excited that we get an early bonus ultrasound picture to swoon over! The ultrasound technician took the measurements, showed me the Little One on the screen, and yes, printed me that coveted picture – the one I would later bring to announce Baby to my Pop Pop. She said the due date was March 21. The first day of Spring! The first day of new life. The first day we could plan to hold our Little One. So perfect! I was in love. But I was also worried about a few things… how were we going to afford another baby? We were barely making it work since adding the third person to our family and purposefully cutting down my hours at work. Where would Baby sleep in our two-bedroom house? Since they’d have to share a room, how would they both make it through the night and naps without waking each other up? How would I be able to function and take care of a two-year old when I’m sleep deprived and nursing a newborn? I noticed some spotting one morning, so I called the doctor’s office. I had some spotting with my first, so I didn’t panic. It must have been a prime day for ultrasounds. The doctor’s office and the corresponding hospital were booked that day, so they got me in at literally the sixth place they tried. I was a bit nervous, so trying to find the right place in a new hospital and filling out the right forms and then trying to find the next place to go to, and waiting… and waiting… seemed like forever! Finally under the harsh lights on the ultrasound table, the technician and his assistant pointed out a few things on the ultrasound picture like the yolk sack. I finally asked, “Does everything look ok?” He asked me when the due date was, and then he suggested it might be more like March 26. Even more perfect, I thought! My Dad’s birthday! I forget now the exact words he used to answer my question when I asked the second time. But whatever the answer was, I took it to mean everything was normal, and we were back on track. He also said he would send everything to my doctor, who would call later today. What does that mean… really? What can I do? How can I best fix this? Um, what? Did you really just tell me to relax after telling me Baby isn’t doing well? We scheduled an appointment for a week later. Then we would know more about Baby’s heart. I wept. I called my husband and sister and parents. I felt almost in a daze the entire week. I was afraid to move. Afraid to eat. Afraid not to eat. Afraid to cough. Intensely sensitive to every sensation, wondering what it meant. In a fast-paced life, I had craved down time. Now, my world slowed to an agonizing pace. My husband and I went to the ultrasound at the end of the longest week of my life. We waited for ages as the tech worked. Then the words. Grief. Shock. Emotions so heavy. “But at least you have a child at home.” This doesn’t comfort me. I love my child at home. I love this Child just the same. I didn’t mourn a pregnancy; I mourned My Baby. I didn’t want just another child. I wanted This Baby. This Life. The waiting was over. But it wasn’t. We went down to the waiting room, full of unknowing pregnant women, before we could talk to the doctor. The nurse led us back and recorded my weight, my blood pressure. Really? Did she even know I lost My Baby? Why was my blood pressure important right now? The doctor knew. He rattled off numbers. One in every four women miscarries. Miscarrying is most common in the first 12 weeks. But there is no comfort in numbers. He explained the options, and we went home for more waiting. I had never really considered this part. My Baby’s body. We waited. When nothing happened, I followed the doctor’s advice to have a D&C. Typically, I research and confer and try to educate myself. This time, I did not. I felt I couldn’t digest anything. I just followed his recommendation and found myself in a cold room awaiting surgery. It was so medical. Not comfortable, warm and caring like the birthing suite at the same hospital two years before. It was cold. Minimal. A matted print had fallen crookedly within the frame on the wall, so I couldn’t even make out the scene. No one else seemed to notice or care. I was there to have a medical procedure. That’s it. To them, it was simply another minor surgery. To me, it officially marked the end of My Child’s life. They wheeled my bed past the non-stress test rooms where I spent three days every week with my firstborn under my skin the last few weeks of her pregnancy. Emotions swelled. Only one member of the anesthesiologist team offered his condolences. That meant the world to me. This wasn’t just another surgery, and he acknowledged that. The crescendo of emotions culminated in the surgical waiting room. I clung to the words I had read over and over while in the waiting week, from a list I compiled of comforting truths from God’s Word. “From the end of the earth will I cry unto thee, when my heart is overwhelmed: lead me to the rock that is higher than I.” (Psalm 61:2). If I was ever overwhelmed, it was now. Overwhelmed. I pictured what I felt… turbulent, deep waters crashing over me so much that I sink below; my feeble attempts of escaping it on my own are futile. But I cry out. “Lead me.” I envision what the Psalmists painted in his words. Stalwart and gentle hands cradle my entire existence and lift me up out of the waters. He gingerly places me on a towering, solid rock that I never could have climbed on my own. I bask in the sunlight and feel the warmth radiating from the rock. The storm still rages, but He rescues. I don’t have to worry about solving our small house, two-bedroom dilemma. I’m not trying to master the art of holding a cranky toddler while maneuvering a growing bump. My early worries are now missed joys. I wouldn’t be wearing a maternity dress to my cousin’s wedding. We wouldn’t be celebrating Baby’s first pre-born Christmas. We wouldn’t be gawking over ultrasound pictures or talking to my daughter to get her ready to welcome New Baby to our family on the first day of spring. It was back to normal. Except, it wasn’t. The hardest thing about following the three-month rule, about not sharing news of a baby, is allowing the baby to go unnoticed. Unremembered. I don’t feel I need need other’s sympathy, but I do want people to know about the Little One. I need them to know that we are no longer a family of three, even though only three toothbrushes are near the sink, three coats hang by the door and three heads lay on their pillows at night. One of us is not here. My life is forever different. It looks the same to most. There are no visible signs of change. But my life is changed. And not merely changed back to what it was before I knew I was pregnant. It changed once when we discovered the Baby was alive. It changed again when we discovered My Little One was gone. I lost My Child, my grandma and my Pop Pop in 2013. My grandma had suffered from Alzheimer’s for years. Before that, she was an exuberant, event-planning, Uno-playing grandma who loved to sing and have sleepovers with her grandchildren. My Pop Pop was a witty, hard-working, polka-loving war vet and gardener, a great storyteller whose thumb was the deepest shade of green. My Child? I can’t tell you what My Child’s favorite color was. I can’t explain how My Child’s temperament compares to his sister’s. I don’t even know My Child’s name. After my grandparents’ passings, it was comforting to gather with others who loved them. To recall that person. To remember the happy times. My pain reminded me how deep my love was for them. I didn’t have that with My Child. We couldn’t reminisce. Hardly anyone knew this Little One even existed. Those who knew were supportive, but after the initial “I’m sorry,” bringing up the loss of a child is apparently taboo. Like no one wanted to remind me it happened. But the truth is… It happened. Little One was here. And then gone. Though it’s not easy to talk about, I will never forget it happened. I remember when I cancel the ultrasound. I remember when a pack of newborn-size diapers appears in the mail. I remember when I see photos of young siblings. I remember when I see a friend’s due date of March 21, 2014. I remember when I put on a non-maternity dress for my cousin’s wedding. I remember when I open my eyes, when I breathe in, when I exhale. I will never forget Our Child. And to speak of it might be painful, like it is to speak of my late grandparents, but it’s also good to know that a life is remembered. Is it easier because we don’t have those memories? No. Is it less painful if I just never talk about it again? No. I could pretend it didn’t happen. It would make answering questions easier. Now, the answers are more complex. And so are the questions. I confidently do not know. But I also confidently do know a few things. And though I only know a few things, they’re pretty tremendous things to know. God is the one who gives life. No matter how much our society is deceived into thinking that we get to choose when to have a baby, God is the one to grant life. He is also the one to take it away. As I was waiting and wondering and wandering through the longest, hardest two weeks, he already knew the outcome. He was already there. And He is already there on March 21, 2014. God knitted my Little One in my womb. Although the knitting was abruptly halted, He loved My Child, and He was not surprised when My Baby’s heart stopped beating. He numbers our days. He knew the number of My Child’s days would be exceedingly lower than I ever dreamed. His ways are higher than my ways. His thoughts are higher than my thoughts. He is good. I am not even sure if heaven works this way. In fact, it probably doesn’t, because all of heaven’s residents are likely too busy worshiping the one true God to greet the newcomers. But, it would be nice if God allowed my grandparents to hold their Great-Grand-Baby in heaven… or if it doesn’t work that way, to even brush by each other as they are mid-song, praising the one who knitted them all. I plan to do something to honor and remember My Baby. I need to find purpose in the pain. More on that to come. I’m still grieving. I always will be. And although it’s not always easy, I rest in the fact that God will do His will and not my “supposed-to-be” plan. I’m not seven months pregnant today. I’m not supposed to be. God is working. God is love. God is good. Even when… No, especially when I don’t understand. My Child is not in the womb of an imperfect mother, but in the arms of a perfect God – who, as I never will, knows My Child’s name. Stumbling across your story was so similar to mine. I found out I was pregnant with my first child in March of 2016, it was a very difficult pregnancy it started off with bleeding and bleeding that would go on right until I had my miscarriage. I went through several appointments till they could finally confirm I was pregnant and that we would be due on November 21st I was beyond happy I had let my doctor know about the bleeding and he said it was normal, that the baby was growing fine and they had a heartbeat, a heart beat I would never hear. I switch obgyns and had my first appointment with her on April 25, 2016 when I went into the room to discuss everything and I informed her about the bleeding she seemed very concerned and took me straight to the ultrasound room I was 10 weeks at this time or almost 11 o remember laying on the table and the technician trying to find the baby, she immediately started taking measurements and asked me how far along I was. She remained quiet after that and as I looked up at the screen and looked at my baby, I didn’t see a flutter I couldn’t see the heartbeat I had seen before. But I thought that maybe I was wrong, I was asked to get dressed and the doctor brought me into the room and she sat me down and said I’m sorry to tell you, your baby has stopped growing and there is no longer a heartbeat. My world crumbled I felt numb, my heart sank. My little one stopped growing at 8 weeks, my baby’s heart had stopped 2 weeks before and I had no idea that my child had died and I was caring my baby who was no longer alive. She told me she could give me something to help with the miscarriage, I could let it happen naturally and if it didn’t happen in a week that I would need to have a d&c. I remember driving home and I jux couldn’t imagine how I was going to tell my boyfriend that we had lost our baby. On May 2nd the early morning hours I was in bed and could not fall asleep I was in excruciating pain, I woke my boyfriend up and knew we needed to go to the E.R the bleeding had gotten worse, after hours of waiting and waiting on the ultrasound results to come in the doctor came into the room and said the most gut wrenching words, you miscarried the baby is no longer there. I felt so numb so emotionless, I held your daddy as he cried over the loss of you. We never knew if we were having a boy or girl we lost our baby before we could really know what they were going to be. 6 months later I lost my grandpa. That was the most painful year I lost 2 people I loved very much and I have never been the same. I still mourn and feel the loss of my baby. Not a day goes by that I don’t think about them, that in November they would of turned 1 and this November they would be 2, it’s heartbreaking to know that all I had was that little amount of time and I will forever miss what memories could of been if we didn’t miscarry. I am a mother but a mother to a child that’s in heaven. When people ask if we have kids I want to say yes we have 1 but they aren’t physically here, but all that comes out is no not yet. I don’t feel ashamed just people won’t understand and it’s horrible to know you have a child but they aren’t physicality here. It was lovely to have stumbled upon this in my search for answers. We tried to keep our miscarriage secret for a while, to protect our baby from being dismissed, ourselves from difficult questions, or maybe to just not have to face it head on. A personal struggle in a public setting. It ended up me alive until I realized that I needed to celebrate her because we only got to love her with our immediate family, and we were all suffering. Months of joy were being erased and forgotten and it hurt. We made our baby announcement with love and pain and it was so healing. . The outpouring of prayer and understanding was overwhelming. Your love for your baby and for God and His plan over yours is inspiring. I needed to know there is faith after doubt. That you can move on and never forget. That you can cry and mourn and still trust Him. I feel like I am letting Him down by letting myself hurt, because I don’t understand it. I can’t understand it, even though I feel comforted knowing that whatever the reason, she never suffered this world, I am still free falling… And He will be there to calm me even while the storm rages. I needed this. Thank you so much. Thank you for sharing your heart. I’m so sorry for your loss. Your little one is so loved. God sees your hurt and gathers each of your tears. He knows this world brings pain, and though He has overcome the world, He gives you freedom to grieve and is with you in your grief. I don’t think understanding is necessary to trust Him. In fact, if we understood it all, it wouldn’t be trust; it would be acting on certainty. Trust and faith happen when we don’t understand it all but believe anyway. You’re so right… it’s not easy. I’ve just prayed for you and your family. Hi Erika, I lost my first baby just one day before the due date on 6th May 2014. My due date was on 7th and I was told to get admitted on 6th. From that morning I felt the baby movement was not that much. But usually it used to be like that in the morning. When I reached the hospital for admission, they checked baby s heart beat and there was nt any. They said it was placental abruption and it might have happened that day early morning but I did not feel any pain or bleeding or anything unusual and baby was moving properly till I slept the previous night. It was so shocking to me but I thank God He has strengthened me so far though occasionally I burst out. I was thinking I should write about it but was not convinced if it will do any good. This beautifully expressed writing of your experience comforted me a lot and convinces me that sharing of my experience can comfort others going through similar situations…Thank you and Praise the Lord! I’m grateful God’s strength is made perfect in our weakness. I pray for your peace and that God uses your story to bring hope and comfort to others. Thank You…You summed everything up for me. I was due this past January and lost at 4 months. It broke my heart to go through labor only to hold a tiny baby with no life in him. I too lost my grandmother during this time.My brother’s girlfriend also died and left her 4 month old baby behind. I like to think she’s looking after my son while I look after hers. I am so sorry for your losses. You have a beautiful picture of your baby being cared for, and I’m sure she would be grateful you’re looking after her son. Prayed for your peace! Thank you for sharing your story. My Little One would be one this June. I still tear up at the site of a newborn or pregnant woman. One day I will see My Little One again. I am so sorry you have gone through this grief, Annemarie. I’ve prayed for special strength and encouragement for you! Tracy, I’m so sorry about your two little ones. It is such a beautiful thing to recognize God’s grace even in the most difficult times! I understand those feelings and I’m celebrating with you that His strength and grace is at work in our weakness! Prayers for you. Thank you for sharing. April 1st of this year was my Third Miscarriage in 1.5 years. We have no children but hopefully we will. Linda, I’m so sorry you had to go through this loss three times. I’ve just prayed for you. Your three children are loved! I’m sorry, a Mama of THREE!! Hi Er! We also have 3 babies….but 1…but 3. I’m crying with you, friend. Thank you for sharing so beautifully. You are most certainly a Mama of 2! I’m so sorry for the loss of your two little loves! And also so happy for the little child God’s given you now! All of those babies are loved and celebrated! Thank you. Erika, it’s a shame you lost your second baby. Years ago my wife lost one too. I’m sorry to hear that, Ken. What a beautiful tribute to our baby. I know we shall see our whole family in heaven. I too struggled with the question how many children do you have? I am confident God’s grace with allow you to heal but never forget. I am so grateful that you are my daughter and I love you very much. I love you, Mom! So grateful for you. Thank you so much for this. I experienced a miscarriage this week. This post was so helpful because its exactly how I’m feeling. I wish that I had announced on Facebook because then people would know our second child existed if even for a short time. He or she is loved! I’m so sorry, Monique. It’s never to late to share; I have found people are happy to love parents and child in a unique way even after loss. Your baby is remembered and loved! The story of your child and your family has touched my heart deeply. I am so very sorry for the loss of your little one and my heart hurts knowing the pain that is involved. I have 2 precious boys on earth. 4 & 2. And his week I have been miscarryimg my third child. Dakota Avery. I do not know how far along I am. I believe 9 weeks. Our doctors do not see you until 8 weeks. I began spotted a few days before my first ultrasound. They believe I was closer to 5 weeks, 3 days but no one knows for sure because I was already miscarrying. What is breaking my heart the most is that I never even saw my Dakota. The gestational sac was there by the time we had the ultrasound. My child had not formed enough to be seen via ultrasound. No child to see. No heartbeat to hear, or not hear. No picture. Not even one. As I read your story, while miscarrying the rest of the pregnancy, I struggled. I coveted your picture but then as God began to use your words to speak to me, I realized that the pain you have gone through, mirrors my own. He reminded me of His promises through your words. I’m an emotional wreck. I’m at a loss. I have lost my child. And I feel so alone. Thank you for sharing your story. Bless you and your family. I am so sorry for your loss. I completely understand being an “emotional wreck” and at a loss. My heart breaks that you never got to see your baby; however, the first time you get to lay eyes on your little one, it will be to see your child’s perfect presence in heaven… not a temporary image here in this broken world. I pray for you to find comfort and peace even through such deep pain. I mourn your precious Dakota Avery with you. You are not alone, even though feelings may deceive you into feeling that way. I know it’s so hard to cling to truth in the middle of such pain, but in my experience God’s truth is the one thing that got me through it. “God has said,’Never will I leave you; never will I forsake you.’” He is both with you and with your youngest child, and He loves you both deeply. God bless you and hold you! Erika – Thank you so much for sharing your story. We have a mutual friend (Cyndi K) who sent me the link to your blog. I lost my baby girl at 18 weeks just four weeks ago and it’s still very raw. I have shared your blog with others since I feel like you have written the words that I wish I could have expressed. I totally agree with your feeling that the “three month rule” is ridiculous; we are excited as soon as we know there’s a new life and should be able to share whatever comes next with those special to us (yet not the whole of FB, likely). I lost my first pregnancy at 9 weeks and suffered alone not knowing anyone else who’d had one and in too much pain to share it. This time around (and being farther along), I have wanted to share and found so much healing in the process. We need to have people grieve with us and celebrate that child whether the baby is here or in Heaven. I also have found much comfort in many of the verses you shared. I am so thankful to have my faith which assured me that He can make good come from ashes. I will remember your child just as I have asked my family and friends to make sure my little girl doesn’t go unremembered. Julie, I’m so sorry for your loss. I’m so glad you are beginning to experience healing and can celebrate your precious little girl! And I’m glad my story, and especially the verses, are able to help a bit. Your children will always be lovingly remembered! Erika, I can only imagine the strength to be able to share this. Your baby IS with you, watching over you from the arms of our loving God. Prayers and hugs to you my friend. Erika, I think I have only met you on facebook. I may have met you during the greeting in church on Sundays past. I feel as if I have known you a long time after reading this very heartfelt witness of all you have experienced in these past two weeks. I saw you Sunday from where I sit and wanted to get over to you to thank you for accepting my friendship on FB and had some little people to tend to from my Sunday school class and missed you. I appreciate so much your sharing your heart in this way. I have never experienced a loss like yours but wept with you through your story imagining what it must be like to carry to almost full term and then having to accept God’s plan for you right now. Thank you for being so transparent. I will pray for you to continue to hear God’s voice as He leads you through this healing process. It is clear that you want to do what pleases Him. Thank you, Ruth. We actually lost the baby in the first trimester, so we were far from full term. This is now just the first we’ve made it truly public. But thank you for your prayers! I’m so sorry to hear you lost your Little One. Thank you for sharing your story! You are such a beautiful and elegant writer, and your post was a powerful description of what this kind of loss is like. I’m so glad I got to read this:) Your story is a great help for those like me, who have friends that have gone through a miscarriage and don’t know what to say or do for them. Praying for you! Thank you, Alyssa. I’ll say a prayer for your friends; you’re a good friend for trying to understand and respond to their loss in the best way! Oh, Erika. I’m so sorry that happened. I don’t fully understand it, or the repercussions, or the grief. But I think I can start to, or at least try. You know, I don’t know if I have ever prayed for you specifically by name before. But I did today. Prayers are so appreciated, Amy! Thank you for that! I am so sorry, Erika, that you were grieving and I didn’t even know. This is a beautiful tribute to your Child. Thank you for sharing this, your face and heart were probably tear-stained as you wrote. I have experienced the peace that comes from knowing God is good, and He always does that which is right. It is a comfort, a peace, yet still an ache. Blessings to you, Erika. Well done. Erika, thank you for sharing your painful story so beautifully! And He gives more grace. I was just writing my miscarriages story this afternoon to publish one day on my blog. It’s not ready yet. I do have a beautiful but simple piece of jewelry to commemorate my four sweet babies that I lost in 2010-2011 – whose names only the Savior knows. It is engraved with Psalm 34:18 and has four pearls hanging from it. I also have a poem/hymn by William Cowper that grows more meaningful with each time like this in life (God Moves in a Mysterious Way). I hope His gentle hand continues to mold us perfectly through both joy and sorrow into His image! Thank you again for taking the time to share. So brave for sharing Erika, it is hard to put these experiences into words but you have used your gifts to encourage others despite your pain. Your sweet babe was real and loved. We serve a great and loving God and I will be lifting you up in my prayers! Death is an enemy. You know that firsthand, and it’s awful. And we yearn for the day when He shall wipe away every tear, and there will be no more death. Come, Lord Jesus! Amen. It does make me look forward to heaven that much more! Thank you. I do hope some good comes from it. Oh Erika, I am so sorry…and do create your memorial – a tree planted, a Bible given, something. I remember losing a baby at just here months, and in those days, you didn’t tell, and even those who knew what I was in the hospital for said nothing. I think I really started healing when I was teaching about this in Women Counseling, and suddenly I felt it all again. You wrote beautifully and I know you ministered to every one of your readers, and those who are touched by those who read it. Hugs!! You desribed this perfectly. Miscarrying felt every bit this way to me too every time. When nothing makes sense, it’s nice to know we can trust that God holds us all in the palm of his hands. I’m sorry you empathize, Emily. It’s truly indescribable how God gives such peace when things are so difficult to handle on our own. Thank you for your encouragement. Er, you have a way with words! SO beautifully written and thank you so much for sharing! I love your blog and I enjoy reading it! Thank you for opening your lives to each and everyone of us! We are so lucky to have you and your family in our lives! Sending prayers … Love to all!! Thank you, Meg! You guys have been an amazing encouragement to us! I have been there. My heaven baby would be 6 this summer and I think about it all the time – even after 2 additional children. Beautiful sharing of your heart friend, love you! Celebrating this life with you and resting in the comfort that the moment baby opened it’s eyes in heaven – he/she saw Jesus. I’m so sorry you went through that, Mandi. That is such a beautiful encouragement, and makes heaven only sweeter! This was so beautiful! Thank you! You have been on my mind so much since Sunday! Praying earnestly for your whole family! Prayers are so appreciated, Melanie! Thank you so much!